Lindsay Berra is an avid CrossFitter and a national correspondent for MLB.com. Follow her on twitter @lindsayberra. Independent coach Paul Reddick helps hurlers throw harder and stay healthier. He has scouted for the Pirates and written books with ex-big leaguer and biomechanics guru Tom House. 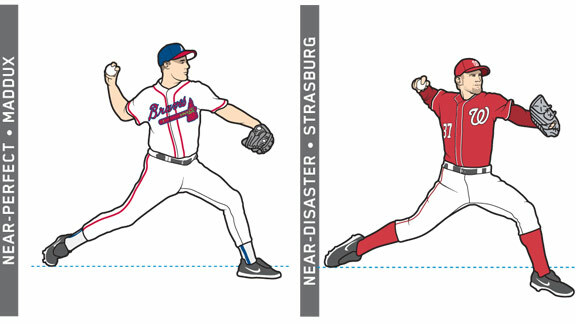 The Mag asked Reddick to compare the flawed delivery of Stephen Strasburg with the model motion of retired legend Greg Maddux. "Maddux's lift is very efficient. It brings him only forward. His front shoulder is directly in line with home plate" -- denoted above by the dotted blue line. "Strasburg has negative movement toward home plate. He overrotates toward second base; his knee has passed his belly button. Now he has to stop all that energy going back and regenerate it to come forward. He'll never overcome that wasted movement and misdirection." "Maddux's spine is straighter; he's stable on his back leg with his head and spine over his center of gravity. 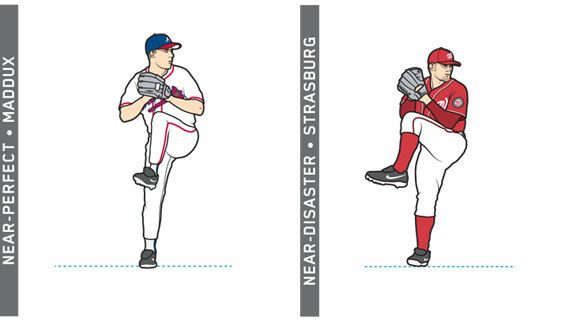 Strasburg's spine is at 11 o'clock, and his back leg is straight. He's striding too far toward the righthand batter's box. He then has to literally fight across his body toward home plate. He's out of sequence: His shoulders are already pinching back to throw, but his front foot hasn't yet hit the ground." "Maddux's lower half is still tracking toward home plate. His arm remains back as his hips begin to turn. This is the classic torque position. 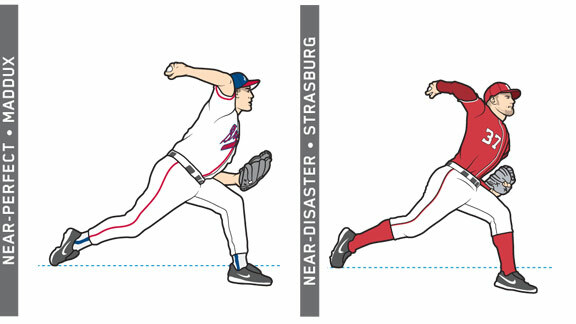 Strasburg's misdirected stride, mirrored in the tilt of his head" -- and reflected by his distance from the blue line -- "inhibits his hip rotation. He'll never harness torque as easily as Maddux and will have to strain his upper half to finally face home, which increases the stress on his arm." "The position of Maddux's chest shows how much farther he is toward the plate. 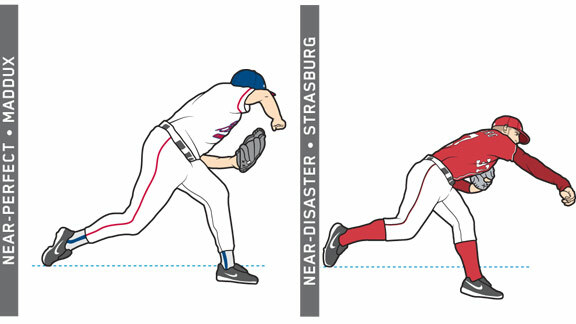 His elbows are in front of his body in a position of strength, with good glove position in front of his knee. Strasburg's elbows are passing behind his body. This is a weak position, and he's working to overcompensate for his lower half's poor position. He's also pulled his glove back to help him square toward home. A sloppy glove is a sign of sloppy direction." "Maddux's head and shoulders are almost still in line with home plate" -- and the blue line. 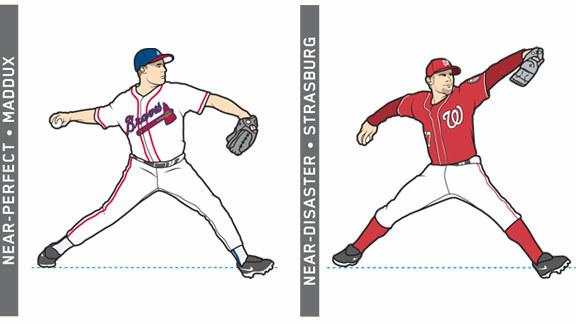 "Strasburg is now leaning way to the left because he's swung over to compensate for veering too far to the right early on. And he's still not on target for home. The follow-through is a byproduct of everything that happened before. You can't have bad mechanics and a good follow-through, and you can't teach a good follow-through." Follow The Mag on Twitter (@ESPNmag) and like us on Facebook. Illustration photo reference from top: Jonathan Daniel/Getty Images; Stephen Green/MLB Photos/Getty Images; Robert B. Stanton/Wireimage/Getty Images; Jonathan Daniel/Getty Images; Michael Zagaris/MLB Photos/Getty Images; Focus on Sport/Getty Images; G Fiume/Getty Images (5).